HORTONVILLE, Wis. — A company that produces novelty glassware embedded with a bullet as if it had been shot has decided to give every employee a handgun as a Christmas present. Giving employees their choice of revolver as a gift is part of an effort to promote personal safety and team building, Ben Wolfgram, who co-owns Hortonville-based BenShot, said Tuesday. The business has 16 full-time employees, including several veterans. But the business also has employees who had never fired a gun, he said. This is the first time his company has done anything like this, Wolfgram said. The father-son business was started in 2015 in a small garage workshop in this village of about 3,000 residents 100 miles northwest of Milwaukee. 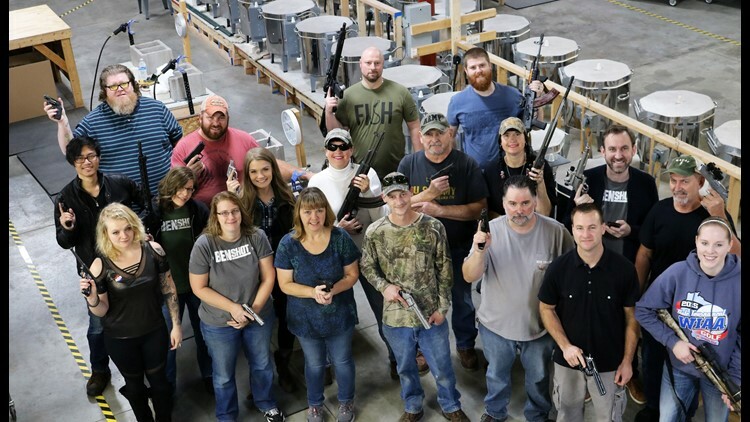 Employees at BenShot, a business that produces glassware embedded with bullets, show off their guns at their workshop in Hortonville. Each employee was given a handgun as a Christmas gift from the business. “I've never been a part of anything like this,” she said. The national debate about guns was thrust back into the spotlight recently after the Oct. 27 shooting at a Pittsburgh synagogue and the Nov. 7 shooting at a bar in Thousand Oaks, California. Two months ago, a gunman wounded four of his co-workers at a software company in Middleton, Wisconsin, before police shot and killed him. Wolfgram said he wasn't worried about workplace violence because his business has a small staff and all of the employees know each other well.